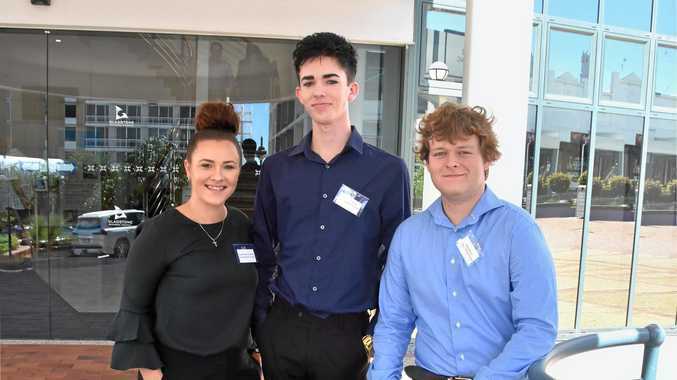 GLADSTONE Regional Council's most recent intake of trainees and apprentices was the largest of the past three years, and there are plans to expand the program further. A total of 16 recruits were welcomed by council this year, including 14 who started in their positions yesterday and two others not long before. Two more "specialised” apprentices will also be employed within the next few months in an electrical and a mechanical role. Chief executive Leisa Dowling said council received 535 applications ahead of recent intakes and planned to deliver more positions in years to come. "It's one of our goals to increase the number of apprentices and trainees year on year,” Ms Dowling said. "There are some fantastic careers in local government and we have an ageing workforce. Mayor Matt Burnett said recruit positions varied in duration, most spanning two years, and a strenuous application process ensured only the "best of the best” made it through. He said council was committed to training young people in various fields who were passionate about learning and giving back to the community. "(They are) the ones who've got the determination and the drive to get up every morning and come in and learn,” Cr Burnett said. "The certificated and the qualifications they'll get at the end of the traineeships are going to be invaluable to them whether they stay with council or go work somewhere else in the local community. "... Whether they're here at council chambers, whether they're at one of our building next door or whether they're at the entertainment centre. Recent Chanel College graduate Jakob Humphries received a one-year human resources traineeship and was "over the moon” to be given the opportunity. "You heard about the amount of applicants there were - that's a lot and to be considered for this is a honour and I'm really appreciative of that,” Mr Humphries said. He said he looked forward to making connections, learning new skills and receiving a Certificate II in Business and Administration upon completion of his traineeship. "I can see this taking me far into the future,” he said. Similarly, new recruit Nathan Brown is gearing up to become a "super gardener” with his Park and Garden Horticulture traineeship. "I've always enjoyed gardening and I've been looking for a good hands on role that will let me stay outside, do lots of work and get a hands-on education,” Mr Brown said. Business administration trainee Teleah-Rose O'Halloran said she considered herself "extremely lucky” to have landed a place. "Getting into council is something I think a lot of people aim for and it is a very hard thing to go through the process,” Ms O'Halloran said. "I'd just been applying constantly for different roles ... to get the call back saying I'd been successful just meant everything, it was awesome.